Why is the Turboion Rbb Croc Classic Straightener so Effective for Straightening Black Hair? Do you have medium or longer length black hair that you have trouble straightening with a flat iron? It is a common problem and often has more to do with your flat iron choice than anything else. One flat iron we have been hearing works well on medium to long length black hair is the Turboion Rbb Croc Classic Straightener. That is one of the reasons we have decided to do an in-depth review on it. Read along with us to see if this may be the right flat iron choice to straighten your black hair. Croc is known for making some of the most ergonomic hot hair styling products and this flat iron certainly fits into that mold. It has a unique design that lessens the wear and tear on your hands as you straighten your hair. What else does it do well? Having 17 different digital heat selections between 280°F to 450°F certainly will help you straighten your black hair very effectively. Its 1 ½” plate size is ideal for medium to long length black hair and will make the straightening process go a lot quicker too. This product not only features a nice ergonomic shape but its edges are nicely beveled for safety reasons too. That way you do not catch your hair on the sides as you straighten it. The temperature is displayed in a large digital window on the top of this flat iron too. Handling the weight of this flat iron is no problem when using it. It only weighs around 1-pound. It also allows for a lot of freedom of movement when you are straightening black hair with it thanks to its long 9-foot power cord with 360° swivel end. There is nothing as effective as high heat when it comes to straightening black hair. 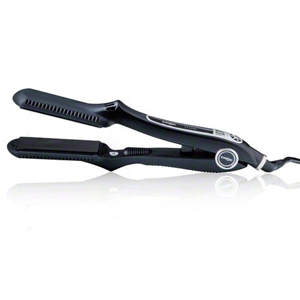 The Turboion Rbb Croc Classic Straightener has high heat to spare. 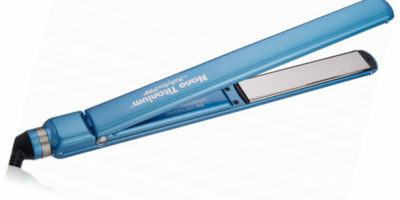 Its max temperature of 450°F is about the highest heat setting you will find on any flat iron. It also does no good if you have a flat iron that does not heat up fast. That also is not a problem for this hair straightening tool. That is because its heat plates are coated with titanium and ceramic compounds. This means the Turboion Rbb Croc Classic Straightener will heat up fast and stay that way throughout your black hair straightening process. The warranty period on this flat iron is nothing special. That is a little surprising considering this is a professional quality flat iron. Its 1-year warranty is disappointing, to say the least. One thing that many users did not like about this hair straightening unit is the location of its on/off switch. It’s very close to where you grip it. This can lead to you accidentally turning it off while you are using it if you are not careful. It must also be noted that 1 ½” wide flat iron heat plates do not suit all black hair lengths. This is especially true for those with shorter length black hair. Is this flat iron from Croc perfect? Not by any means. We do have to say we feel it’s better than many flat irons we have seen when it comes to straightening black hair. 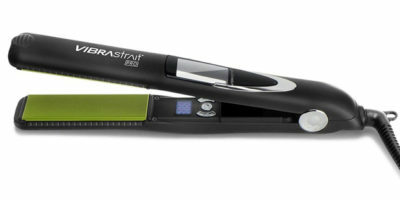 Its ergonomic design makes straightening your black hair very effortless and its high heat selection only adds to that. When you factor in such things as its dual voltage capability, ceramic/titanium heat plate coatings and its light 1-pound weight, you have a product that anyone who wants to efficiently straighten their black hair should consider buying. Best-Selling Flat Irons For Black Hair!